Oscillating front axle promotes longer undercarriage life, improved stability, while maintaining constant ground pressure for a better ride. Dedicated oil circulation pump with bypass for cold start up. Side by side cooler package with swing out door for ease of maintenance. Hydraulic reversing fan for quick cooler cleaning. Removable multi-section belly pans give full access for easy cleanout and great serviceability. Solid Engine Compartment cover to p revent debris from entering engine enclosure. Cab tilts t o allow full access for servicing of components in center of machine. Equipped with fire suppression & positive air shut off. Welded mainframe with double layer of high strength cold formed steel. 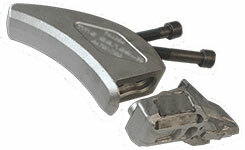 Specially designed front end for facilitating the input of material. Front quadruple chain curtains + 1 extra curtain. Cat. II with incorporated quick hitch coupling to tractor. 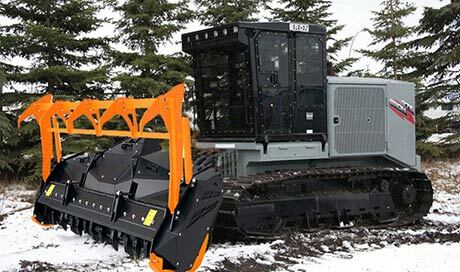 Hydraulic rear hood made of high strength steel (for facilitating the material entrance and obtaining the best finish in mulching). Sidestep system in frame sides for overcoming obstacles. 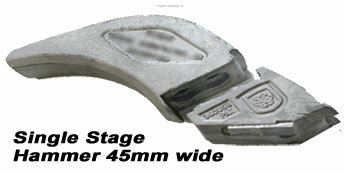 Height adjustable rounded side skids (3 positions). 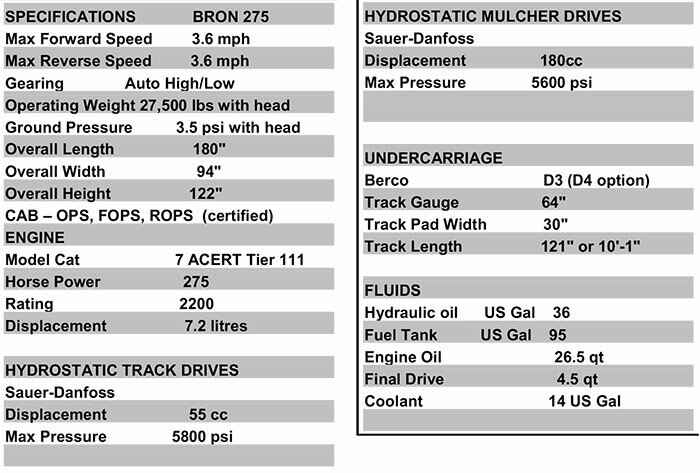 Protected hydraulic hose connections and lubrication points. Rotor assembled with fixed hammers. 12 XPB drive belts with ESB system. Rotor Assembled with external loading self-aligning spherical roller bearings. Hammers with 2 carbide tips. Hammer holders S02 type welded to rotor with double helicoidal arrangement. 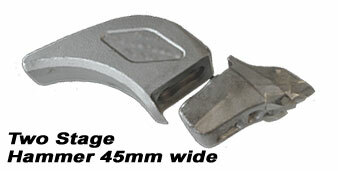 Height adjustable rounded side skids (2 positions). 10 XPB drive belts with ESB system. Hammer holders S08 type welded to rotor with double helicoidal arrangement. Greatest density of carbide hammers in the industry. Unique efficient, spiral cutting pattern. Lubrication points protected and well marked. 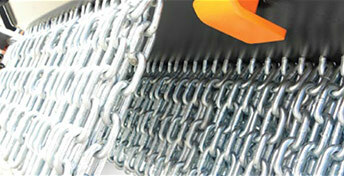 Twin double chain curtain (4 rows). Adjustable, 20mm HARDOX® steel skids. 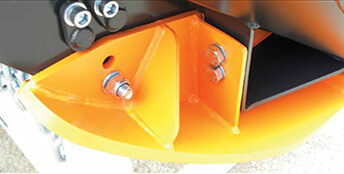 Easy to replace, bolt on carbide tipped mulcher teeth with the DuoBoltTM locking system. 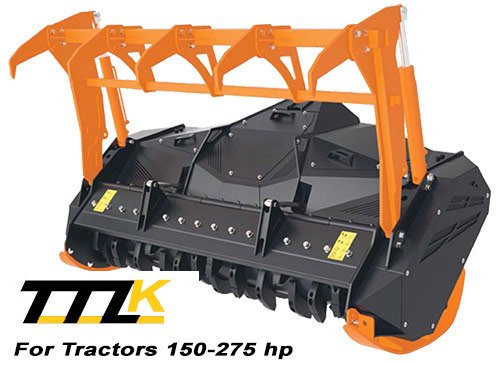 The TTLK mulcher features a 45 mm wide “single stage” tungsten carbide hammer. 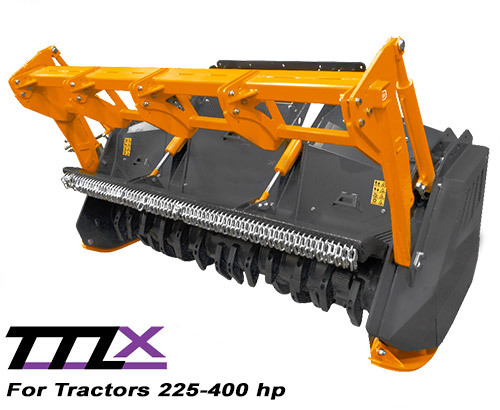 The TTLX mulcher features a 55 mm wide “two stage” tungsten carbide hammer. All SEVENTM TT Series mulchers feature tungsten carbide hammers that are fitted to the forged hammer anvil using two bolts and the patented Pego LocTM system to retain each hammer. This robust construction and easy maintenance ensures minimum downtime and lowers long term maintenance cost. Each mulcher also features two hammers with extra tungsten carbide edges, one on each end of the rotor. F04 for the TTLK model and F10 for the TTLX model. 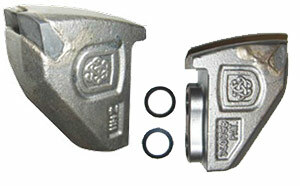 This ensures extra hammer protection and long life from material hitting the sides of the mulcher. The SEVENTM TT mulchers welded body of DOMEX® steel and skid pads made from HARDOX® steel give the mulcher a long and productive life under the toughest conditions. 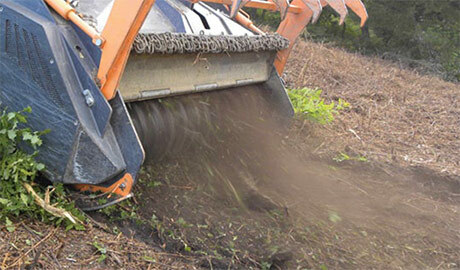 The smooth sloped body style of the SEVENTM TT mulchers are designed to prevent accumulation of mulching debris. 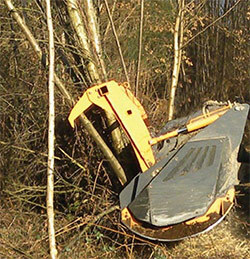 SEVENTM TT mulchers are available with optional tree guard frame or hydraulic guard frame incorporating retractable raker teeth to aid in the mulching of large brush and small trees. ** The weight of the machines is approximate, it refers to the standard version with any options and it may vary. The information and images contained in this document are to be considered reference values. The St. George Company reserves the right to make changes without notification. 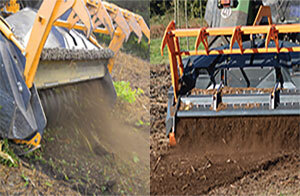 Research has shown that when mulching with machines over 200 HP, the mulching properties change. This why on SEVENTM TT series mulchers the hammer used on a 100 HP mulcher is not the same hammer used on the larger models. The Model TTLX features unique “Two stage carbide hammers”. These F05 and F10 hammers have two separate levels of carbide cutting surfaces and a reinforced forged steel anvil which attaches the hammer to the rotor. With the two stage hammer the central carbide point penetrates wood easier, the wider second carbide blade increases mulching action and lowers fuel consumption. The F10 hammer has additional tungsten carbide edges for extra long wearability. 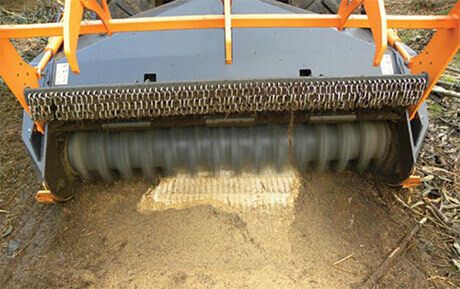 With the two stage hammer: increased mulching speed, with lower fuel consumption. Mulching has proven environmental and economic advantages over the use of chemical sprays to control brush growth. Mulching eliminates the potential danger to the soil and water table. 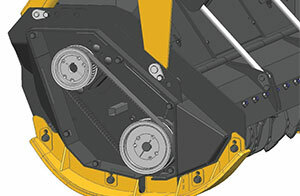 The SEVEMTM TTW mulchers feature a large diameter rotor with a close ratio hammer configuration, resulting in long hammer life, increased grinding capacity and the production of fine “Classe I/Category I mulch”*. A fine mulch gives good ground cover and returns to nature quickly. The SEVENTM TTW mulchers feature a welded body of DOMEX® steel and skid pads made from HARDOX® steel giving the mulcher a long and productive life in the toughest of conditions. A hydraulically controlled gate ensures safe operation: gate is open for cutting and closed for mulching. The machine incorporates replaceable carbide tipped hammers, with the DuoBoltTM locking system, made of special alloys and hard metal designed to provide excellent material penetration and long life. Large diameter rotor thickness. Electronically balanced. 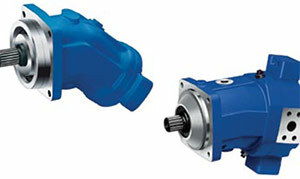 Assembled with self aligning spherical roller bearings with conical inner rings. High performance belts. Replaceable front and rear chain curtains. Available with optional hydraulic guard frame incorporating retractable raker teeth. 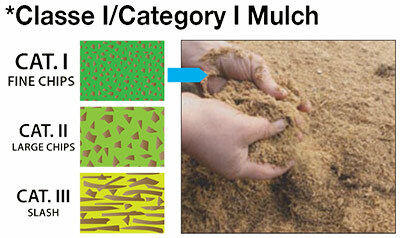 What is Classe 1/Category 1TM Mulch? The SEVENTM line of mulchers are engineered to producing fine mulch (Classe 1/Category 1). This fine mulch decomposes and returns to the soil much more quickly resulting in maximum ecological benefits often eliminating the need to remove debris from the site. 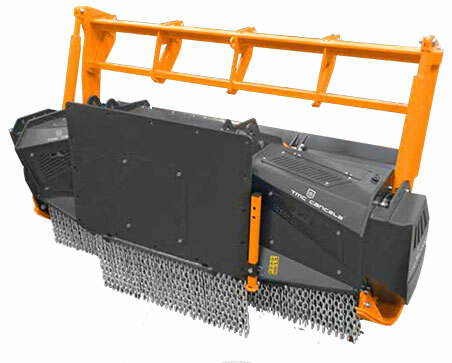 Most mulchers on the market today are capable of reducing brush to slash (Classe 3/ Category 3) or large chips (Classe 2/Category 2).